This blog is for discussions on Art and Design in support of students, artists, and buyers of Art. It is a way to have some fun with my home studio and on-line students and anyone interested in Art History and current events. Comment on this blog as an opportunity to share recent shows and events and thoughts about your own art process. Read about how the CIA used Abstract Art. Pietro-St.Ursula Learn to choose 1. The Medium 2. The Content (Purpose) 3. Compositional (arrangement in the frame) 4. How to manipulate the Elements, and apply the Principles of Design. Linda Armantrout will guide you to make good choices to add impact to your paintings and drawings and collages in this series of classes presented at CFA Gallery, 916 Main Street in Louisville. Each class will combine fresh insights from a lesson in art history with an exciting contemporary assignment. Students will work in a sketchbook to make good plans, and then choose to either draw or paint to complete the assignment. I am excited to share the first lesson about ancient art, and how to use the choices we see in our own contemporary art, with new and returning students. Exerpt from the class: "Giotto is regarded as the founder of the central tradition of Western painting…" There are 2 seats left in the class. It starts on October 5. Click to see Flyer. Call now, 303-664-0086. 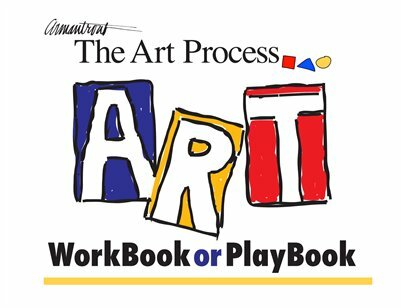 Linda Armantrout Launches "The Art Process WorkBook"
I have packaged this material in many ways for over 25 years. I learn something new every time I teach it. Please see a preview by clicking below on the MagCloud badge. It is available as a real book on paper and is wire bound to lay flat while you do the lessons, or if you like, buy a digital version, or both. Click on the Cover below to preview and/or purchase the book. The richness of our visit continued at the Coffee Cat in the Dunn Shops. We met fine arts photographer, Kathleen Brennan for coffee and to catch up on her work and life. She had just returned from a trip to Eastern New Mexico where she interviewed folks who are losing the water in their wells because of the drought for her new video project. Her still photos are insightful and beautiful. You can see those and previous videos at www.brennanstudio.com Kathleen also received a 3 week residency on the southern rim of the Grand Canyon. She recently interviewed Jim Wagner for a video for The Harwood Museum as part of the current show of RC Gorman and Jim Wagner's work. I am looking forward to her posting of that video. Kathleen told us the story behind the Healy collection, and we went straight across Bent Street to see the work by Jim at the Milagro Ranch Collection, and also enjoyed seeing the WPA furniture. A beautiful drive home and a Bear lumbered across HWY 285 just East of Fairplay. The trip was just one magical moment after the other. I feel so grateful for the connection to Taos that my parents made for me, and for the freshness of this trip to make Taos brand new again. RC Gorman, Su Bah, signed print.The fourth day we had no "must sees". But we should have because we didn't get to the Harwood Museum. (Read tomorrow to see why that turned out okay). The current show through September features artists, RC Gorman and Jim Wagner, who were friends and party buddies of my Mother when she was in Taos 1975 thru 1981. It was very special that they were being honored with a show at the Museum that was at the end of the block where Mother lived across Ledoux from RC's Navajo Gallery. Mother had 2 prints and a book signed by RC that I have been holding in my office for sale since she passed a year ago. There were many full circle moments on this trip. Gratitude for all. We also spent time on Bent Street with jeweler, Emily Benoist Ruffin, who graciously answered lots of questions. We started the day at Old World Art, where Kimberly shared her technique and process with us. I have no words for this experience. Okay, one word, awesome. We saw all the galleries on Kit Carson Road, a favorite for me is Wilder Nightengale. I enjoy all of the galleries and am inspired by the diversity in the art. And a shout out to 203 Fine Art who always have wonderful shows on Ledoux. They show Taos Moderns, and the owner Shaun Richel is an excellent artist. They also have sweet lodging for rent in the back. We came back up the hill from Casita Montoya for dinner in the special rooms where my parents' shop had been. Lambert's is there now. We had a disappointing dinner and service, but it was wonderful to be in the building. All the other meals we had in Taos were terrific, and we didn't even make it to Orlando's.